How Long Have anda Loved Cheetahs? Is The Cheetah A Awesome Animal? pilihan peminat: Yes They Are Very Cool! Do cheetahs ROCK THE BOAT? if anda could be an animal what would it be and why? If A Cheetah Just Come Up To anda What Would anda Do? As anda probably know, cheetahs and leopards look very similar and many people mistake cheetahs for leopards atau the opposite. Look at two imej of a leopard and a cheetah, then you'll see that they're very different from each other. 1. Cheetahs are much lebih lanky, having a thin stomach for easier running. But leopards have lebih muscles, though I may not know much about leopards, but I'm guessing it's for hunting purposes. 2. Cheetahs have a larger chest because they have extra large lungs and hati, tengah-tengah so they can withstand their large bursts of energy. The cheetah is the fastest land mammal on Earth, capable of running 64 miles per hour. However, this cat cannot sustain high speeds for long. Cheetahs typically run in short bursts covering distances of up to 500 yards. Most chases last less than one minute, so the cheetah must quickly catch its prey before it escapes. The cheetah is the fastest land animal in the world. They can reach a bahagian, atas speed of around 113 km per hour. A cheetah can accelerate from 0 to 113 km in just a few seconds. Cheetahs are extremely fast however they tire quickly and can only keep up their bahagian, atas speed for a few minit before they are too tired to continue. Cheetahs are smaller than other members of the big cat family, weighing only 45 – 60 kilograms. The fastest land animal in the world, the cheetah is a marvel of evolution. The cheetah's slender, long-legged body is built for speed. Cheetahs are tan in color with black spots all over their bodies. They can also be distinguished from other big Kucing sejak their smaller size, spotted coats, small heads and ears and distinctive "tear stripes" that stretch from the corner of the eye to the side of the nose. 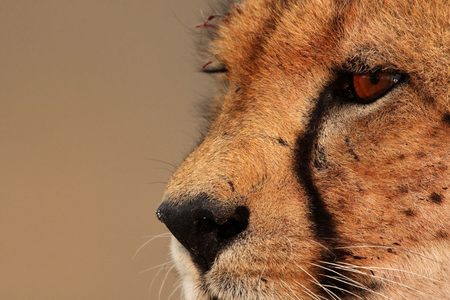 Cheetahs eat mainly gazelles, wildebeest calves, impalas and smaller hoofed animals. No one can out beat these runners. Why even try? The speed of a cheetah is about 112 to 120 km/h (70 to 75 miles per hour) in short bursts covering distances up to 500 m (1,600 feet), and has the ability to accelerate from 0 to 100 km/h (62 miles per hour) in three seconds! Try to beat that when anda would be formed like a cheetah but with out the abilities. If anda ran on fours in a human body like the one anda are in now. And anda ran like that Every. Single. Day. But that's what cheetahs do but at an extreme speed. The cheetah is the world's fastest land mammal. With acceleration that would leave most automobiles in the dust, a cheetah can go from 0 to 60 miles (96 kilometers) an jam in only three seconds. These big Kucing are quite nimble at high speed and can make quick and sudden turns in pursuit of prey. Cheetahs are in the family of the big cats. They are the fastest land animaland can run from over 72 MPH. They are found in wide regions in Africa but are critaclly endangered and they need our help so their regions are dropping along with their decreasing numbers. They are yellow-orange in colour with a black marking on their head along with black spots over their streamline body. Some people say they get their name sejak the word "cheat" because of the super speed. sejak cheat they mean, Cheetahs can beat any land animal in a race so they "cheat". Quite simple. Cheetah stuffed animals, stuffed cheetahs, cheetah print items, and cheetah gifts. What Does The Cheetah's "Tear Stripes" Do?